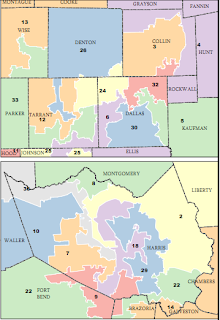 B-Districting: Texas, Are you kidding me? Texas, Are you kidding me? 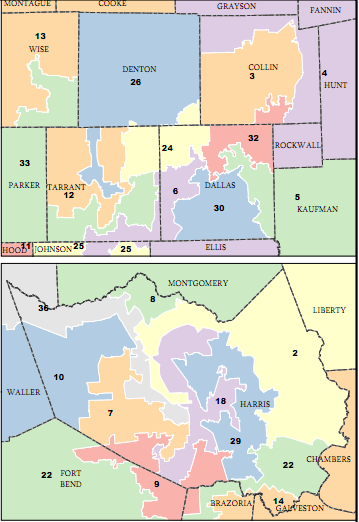 Above: a detail inset from the Texas state legislature's "plan C 125" for congressional redistricting. It is difficult to compare ypur approach for DFW and greater Houston when all we get from your approach is a state-wide view. Can you publish some closeups like their two? Nice site btw. The TX districts are ridiculous. Some may complain about your software breaking up boundaries but just look at what the legislature has done. Austin, San Antonio, Houston and Dallas look like they went through a blender. Though on your map everything is grouped nicely. It is pretty much what I would envision from a redistricting model than isn't concerned with political gain.